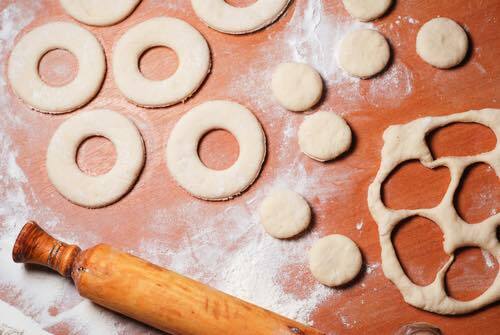 An easy-to-use donut cutter is one of the handiest kitchen gadgets to have in your cupboard. You'll enjoy using one to make great looking donuts the quick and easy way at home. Grandma would have loved one, and you will too. It's not easy to find a high quality dough cutter for donut making since not every local store carries them, except for the cheaper plastic models that don't work as well. But, as revealed below, I found a great little cutter that will do the job well and stand up to years of service. The Ateco 3-1/2-Inch stainless steel donut cutter cuts a perfect donut shape to make the best sized donuts for serving. As one satisfied Amazon reviewer says, "The rings puff up to good sized donuts, not too big, not too small." And it's a perfect size for making small bagels too. The Ateco cutter's outer edge has a diameter of 3-1/2 inches with a 1 inch center hole. This means it's designed for easy handling and should fit comfortably in the palm of your hand, not awkward like some cutters. Your hand won't get tired while using it. Well made of high quality stainless steel, its sharp cutting edges slice cleanly through the dough without mess or fuss. The open top means no clogs and no prying out the dough. This means you'll be able to cut a dozen donuts in no time at all, effortlessly, just like the pros. Its professional cutting edge is sharp, so take care using it. Treat it as you would a knife and you'll be fine. The stainless steel is not only durable, but it's dishwasher safe too. This means it's very easy to clean, and it's safe to leave in the dishwasher while drying overnight. "Cuts the dough into perfect donuts every time." "Just the right size for cake doughnuts." "Gives my donuts a very professional look." "Comfortable to grip and hold." I found virtually no complaints for this cutter. One person's review did say that the dough stuck to it a bit. However, this depends a great deal on how well the dough was made, and it's easily rectified by dipping your cutter in little bit of flour before cutting, as the flour will help to prevent any dough from sticking. 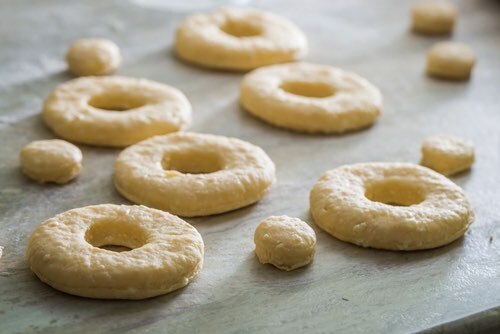 Watch this brief video that gives an easy donut recipe and demonstrates how to make donuts that are cut with the help of this handy kitchen tool. Fry the little "donut holes" and sprinkle them with powdered sugar and cinnamon. Everybody loves to nibble on them! Just imagine the thrill you can create for your family with fresh, homemade donuts that taste the way Grandma's did. You can easily order this affordable donut cutter online from Amazon if you cannot find it at stores in your area.